Arcosanti has announced their 2016 lineup. 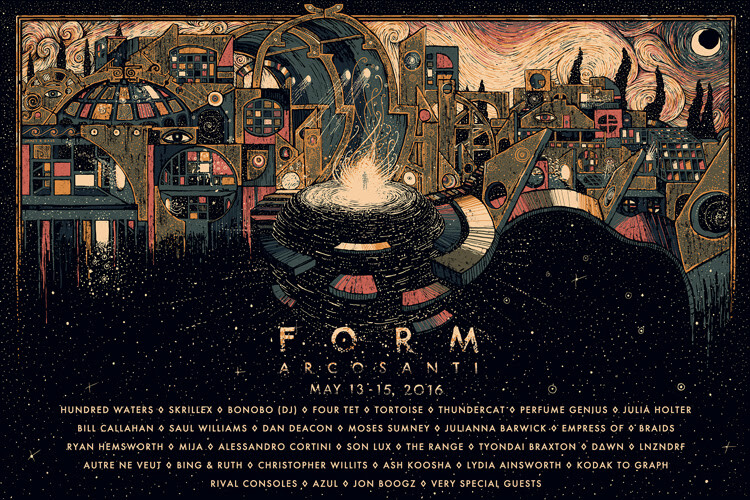 The festival is a merger between Hundred Waters and FORM and is the third edition of the merger’s free-by-application music and arts festival that takes place in three days located in the city of Arcosanti, AZ May 13 to May 15 of this year. The lineup for the fetsival includes: Skrillex, Bill Callahan, Four Tet, Tortoise, Thundercat, Bonobo, Dan Deacon, and Perfume Genius. Hundred Waters created this festival with FORM following the bands experiences performing at music festivals around the globe. Hundred Waters and FORM envisioned something more personal, collaborative, lean, and lasting and the Arcosanti Festival was born. The Arcosanti Festival includes three days of performances, discussions, workshops, installations, technologies and activities that promote the role of art in public life. More information is given on the Arcosanti website. Tickets can be bought through the Arcosanti website.